Life cycle: This insect produces one generation each year and the larvae overwinters in strawberry crowns. Physical Description: This 1/2 inch long caterpillar is white to yellow or pink with a brown head. 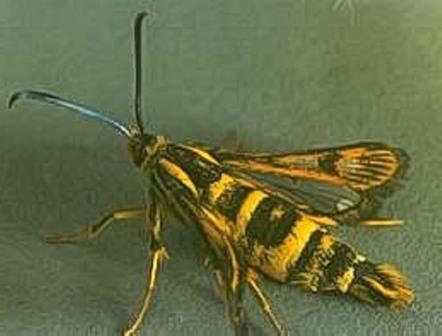 The adult moth is black and yellow with clear wings that span 1 inch. The eggs are laid on the underside of the lower leaves in midsummer. Feeding characteristics: This pest attacks blackberry, raspberry, and strawberry plants by boring into the crowns causing the foliage to yellow. This damage can weaken an older plant and kill a young transplanted plant. Controls: Remove the infested plants and destroy them. The best time to do this is early spring.